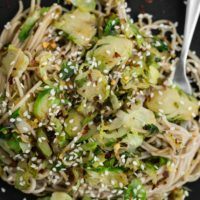 An easy soba bowl that combines quick-cooking shaved Brussels sprouts with sesame and soba noodles. A perfect excuse to use that shaving attachment for your food processor! Using a food processor attachment or a sharp knife, shred the Brussels sprouts and shallot. Heat a large skillet over medium heat, add olive oil followed by the Brussels sprout mixture. Cook, stirring occasionally, until the Brussels sprouts are tender and beginning to brown, 8 to 10 minutes. Cook soba noodles according to package. Drain and set aside. Finally mince or grate the ginger. Whisk together with the rice vinegar, sesame oil, tamari, and honey. Combine the soba noodles and sauce with the Brussels sprout mixture. Stir until well combined. Serve with sesame seeds and chili flakes if desired. Tips & Tricks: If you’ve never pulled out the attachments to your food processor, now is the time. The slicing blade makes quick work of shredding the Brussels sprouts. If you’re wanting to make this gluten-free, look for soba noodles that use 100% buckwheat flour. Vegetables: The simplicity of this soba bowl allows for some easy swapping of vegetables. Broccoli, kale, or shredded cabbage would work well in place of the Brussels sprouts. Vegan: Use your favorite sweetener in place of the honey. Brown rice syrup is one of my favorite substitutes. Noodles: There’s a bit of competing strong flavors between the Brussels sprouts and soba noodles. 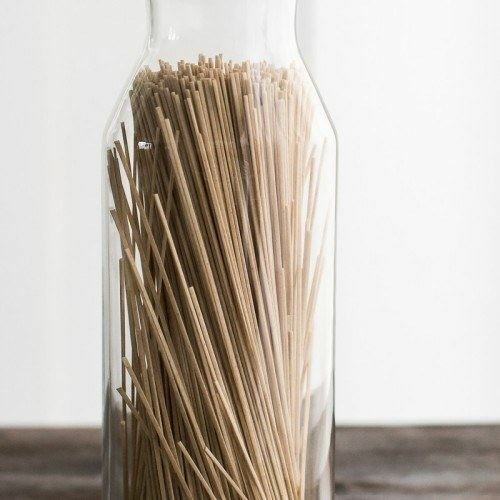 If you’re unsure of the combination, I recommend using udon, lo mein, or even brown rice noodles (which would be a great gluten-free alternative). I like to use soba noodles because they soak up flavor without getting lost. The nuttiness from the buckwheat flavor isn’t overpowering but compliments a range of vegetables. If you’re looking for gluten-free soba noodles, check the package carefully. Many brands cut their noodles with wheat flour but there are a few companies making 100% buckwheat flour noodles. Soba noodles alone with the honey ginger sauce sounds divine! Way to bulk it up with the brussels. 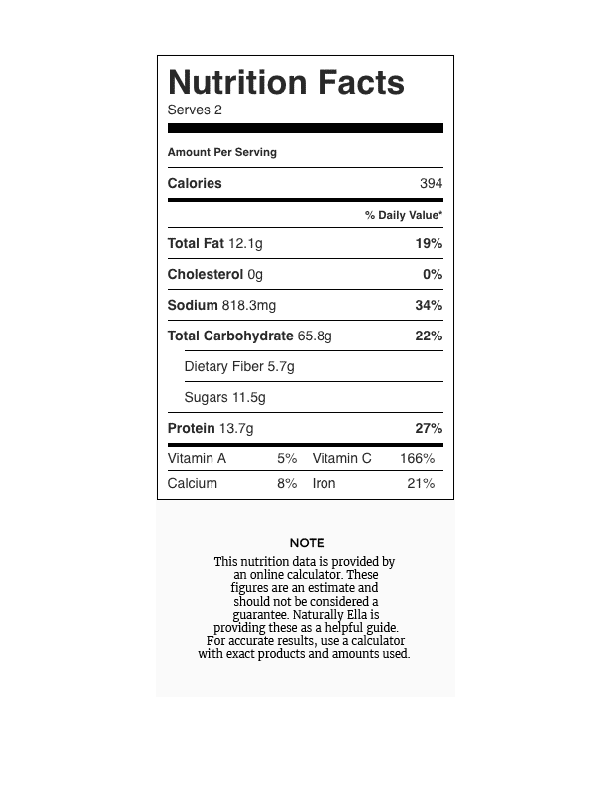 How do you think this would be with kale? I don’t have any brussels on hand. PS Congrats on the foodiecrush feature in the holiday issue! Gorgeous! Heck yes! What a fabulous dinner idea! Tried this for dinner when cooking for my vegan sister – absolutely delicious and going in my regular recipes book! Thanks for the idea! 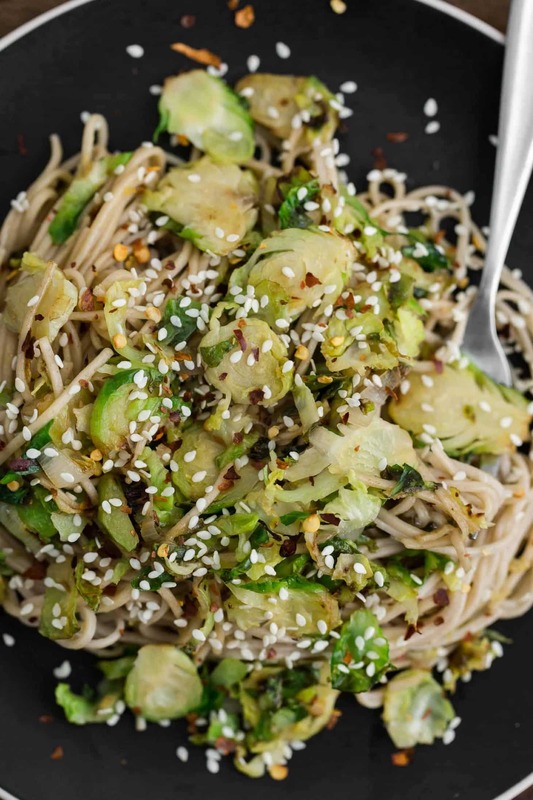 Nice use of brussel sprouts with soba noodles Erin.. Soba noodles are one of my favorites. Love that wooden board (background) of yours, lends such a rich rustic hue! I am always looking for new ways to serve brussels sprouts. This is such a genius way to do it! Looks delicious. This is so good! I used the slicing blade instead of the slicing disk (sorry, food processor newbie) and got Brussels sprout mash, but it tasted great. Next time I’ll use the right blade. The ginger dressing with the sprouts is a great combination. Yum! I’m going to make this tomorrow night! I am sitting here, eating this… thinking about how incredibly lucky I was to stumble across your blog earlier today. Wowzers! This is creative and tasty and really very simple to make. Thank you!!!! We made this tonight and it was amazing. This one is definitely going in the regular rotation. We used tamari instead of salt and served with sriracha. I am so glad I came across your blog. Thank you for the wonderful recipe! Love the simplicity of the meal and Soba noodle has become my recent fav! Very tasty and super easy to make! I’ve made this twice now. So delicious!! Made this tonight and it was delish! BUT I added 2 Tablespoons miso paste, 1-2 Tablespoons Umeboshi (Ume) Plum vinegar, a bit more honey and some sesame seeds to add more flavor. Overall great dish! Can’t wait to make it again! I am making this tonight, as I’m writing this! Yum! 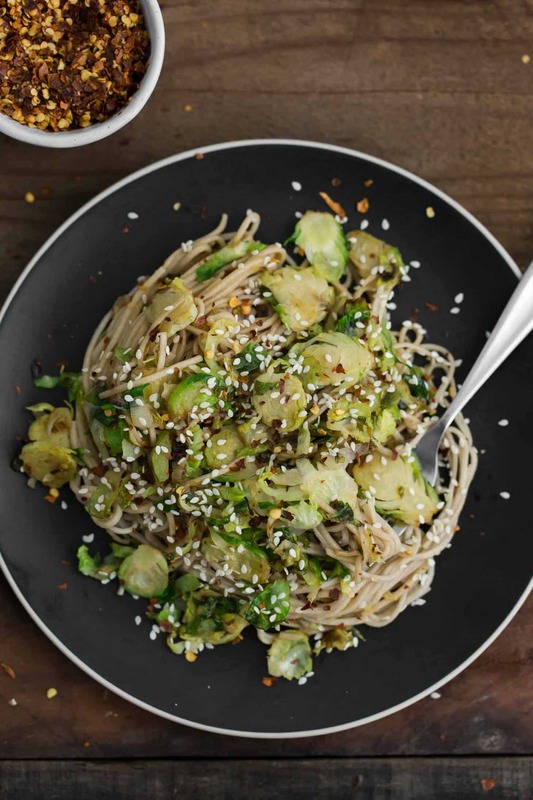 Holy cow, Brussel sprouts and Soba noodles – loks like an awesome dish! I’m always using all the grains in my bowl recipes, so I actually need to change things up and make some soba. Love the Brussels here. I don’t think I’ll ever tire of them. That little sauce it tdf! Nom nom nom! I have made this my sunday supper. I think I’ve had it 4 sundays in a row. SO DELICIOUS! So easy. I had this for lunch today. I was looking for a brussels sprout recipe as I had some lovely ones from the market. I had all the other ingredients already and…Voila! It was delicious!! The only mods I made were to toast the sesame seeds and I used rice noodles because they were in my pantry.